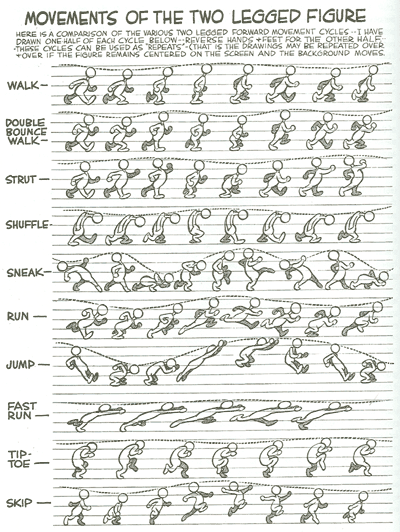 Courtesy of the great Preston Blair who contributed to Disney’s Pinocchio, Bambi and Fantasia here are the forward movement cycles for a two-legged figure starting with the basic walk. The figure above was copied from The Animation Book by Kit Laybourne but the original figure came from Preston Blair’s Animation – How to Draw Animated Cartoons . This is a short 32 page booklet filled with valuble and easy to understand lessons on how to create classic hand-drawn animation.